Urilift Pop-up Toilets are located in London, Amsterdam, and Belfast. These public toilets are located in the Cambridge Circus, the Rembrandtplein, and the Shaftesbury Square respectively. 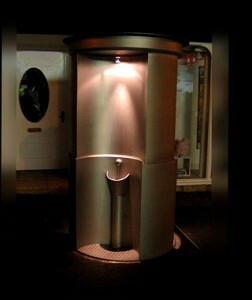 These stainless cylindrical urinals are Europe’s solutions to “indiscriminate” male toilet habits. These receptacles, unlike the lower, open urinals of the past, are easier to aim at. The floor of the cylindrical urinal also has a drainage unit just in case you’re not as well-coordinated as the average visitor.